Independence Day is one of the secular public holidays celebrated in Pakistan. It is observed on August 14 to commemorate the independence of Pakistan from the United Kingdom (as the Dominion of Pakistan). The territory of present-day Pakistan was occupied by the British East India Company in the mid-19th century. British possessions in the Indian subcontinent were known as the British Raj or British India. The lands that would become Pakistan were inhabited by Muslims. In 1906, Indian Muslims created the All-India Muslim League that aimed to create a separate Muslim-majority nation-state. One of the most influential leaders of the League was Muhammad Ali Jinnah, who is referred to as the Father of the Nation in Pakistan. Following WWII, the process of decolonization began. The British Raj was granted independence and was divided into two dominions, India and Pakistan. The Dominion of Pakistan officially came into existence on August 14, 1947. 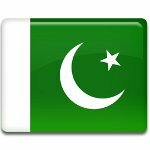 Pakistani Independence Day is widely celebrated throughout the country. Independence Day festivities include special prayers, flag hoisting ceremonies, gun salutes, public speeches and rallies, parades, change of guard at national monuments and other events. The biggest celebration is held in the capital city of Islamabad, it is attended by the President and Prime Minister.